The case for adding email marketing to your overall marketing mix is usually pretty sound. It’s often cited as one of the best marketing channels for ROI (especially by B2B marketers). Email marketing is also relatively affordable in terms of outside spend and resources. There are no ad placements or printing and mailing costs involved, so the external budget required to get underway can essentially be zero if you have sufficient in-house resources. My practice at iBeam has always been to focus on email marketing as a tactic with sustainable payoff and ROI over the medium to long term. It’s certainly possible to get some quick wins with email marketing, but it’s consistency and quality content delivery over time that matters most here. I focus on building legitimate, permission-based in-house email lists organically and engaging these subscribers with relevant, value-added content. Supporting that approach, I use ‘confirmed opt-in’ subscription methods whenever possible, which leaves the subscription decision firmly in control of the email recipient. I also make it simple and painless for email subscribers to opt-out later or change other subscription preferences. This is especially important these days, in light of increasing focus on compliance with user data privacy laws such as GDPR. This targeted approach allows iBeam to help build your brand, reputation, credibility, and trustworthiness with a growing subscriber base that truly appreciates what we’re delivering to their inboxes when we hit the ‘send’ button on email campaigns. It also results in better email performance as measured by higher email open rates, click-through rates, website engagement, customer experience, and conversions to revenue. Budget permitting, we can also send to targeted customer segments via sponsored email outreach. Industry trade journals and similar media sources often have opted-in email subscriber bases that can be reached in this way. 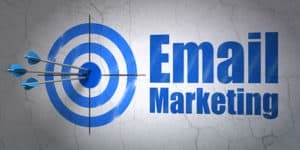 Perhaps the biggest ongoing obstacle to email marketing success lies in having enough value-added content to deliver to an audience that already gets lots of emails from all sources. People certainly don’t open everything that hits their inboxes, and they eventually won’t open anything from email senders who consistently fail to deliver items of real interest. Creating and delivering useful content is key to email marketing success and must be factored into the overall program. Build the email relationship. Build trust and authority. Then sell. I’ll help pull together and update your email list from various sources within your organization (your ‘in-house’ list). These will be contacts that have an ongoing or prior business relationship with you. This is your core initial audience and base for organic email list growth. Email list segmentation is important for improving email marketing performance. I will help you segment your in-house list in ways that make sense for ongoing targeted outreach and campaigns. You may have an email service provider in place already. But if not, I can help you select one that fits your needs and budget. There are many great options to choose from. Having email signup options on your website is a great way to organically grow your in-house email list over time. I’ll help you add this capability if it’s not already in place. These can be simple e-newsletter signup forms or dedicated landing pages that encourage visitors to register to receive specific content. There are many good options here for WordPress websites as well. This is one of the key steps needed to take a simple ‘brochure website’ and turn it into a true lead-generation marketing asset. As mentioned above, you’ll want to have several ways to engage your email audience over time, and this translates into content development at some level. iBeam can help you with this, too. Worried about the time and effort involved? Consider a quarterly or monthly e-newsletter to get started. Perhaps a mix of original and ‘curated’ content from within your industry. I’ll help you develop a content strategy and production effort that balances audience needs and wants with your staff and budget resources. Email marketing is a central component of marketing automation, which automates some elements of customer prospect outreach. This can vary from simple ‘auto-responder’ email series to more complex systems based on advanced marketing automation platforms such as HubSpot, Marketo, and others. I’ll help you determine how much marketing automation makes sense for your business, then help implement the right solutions, as needed. Email marketing is highly measurable. We can track email open rates, click rates, click-to-open ratios, and other measures of email campaign performance. In many cases, we can benchmark your email marketing performance metrics against industry averages as well. And by implementing proper campaign tagging, we can track email performance with Google Analytics. This provides even deeper insights into campaign performance and ties website content into the measurement picture as well. Good measurement gives us the opportunity to continuously refine and improve our email marketing campaigns. I’ll help you make smart choices based on metrics, testing campaign elements and tracking results along the way. If you’re looking for an email marketing consultant in southeast Michigan, including Ann Arbor and Metro Detroit, let’s meet over coffee or other suitable beverage to discuss your project.